Thank you so much for great challenge participation in March!! This month is an easy one, so hope to see lots of you participating! 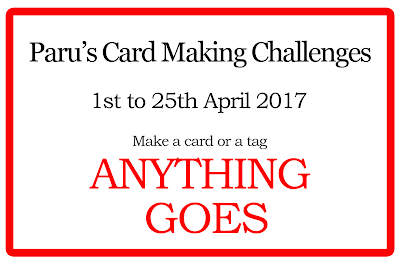 Here is the April challenge! 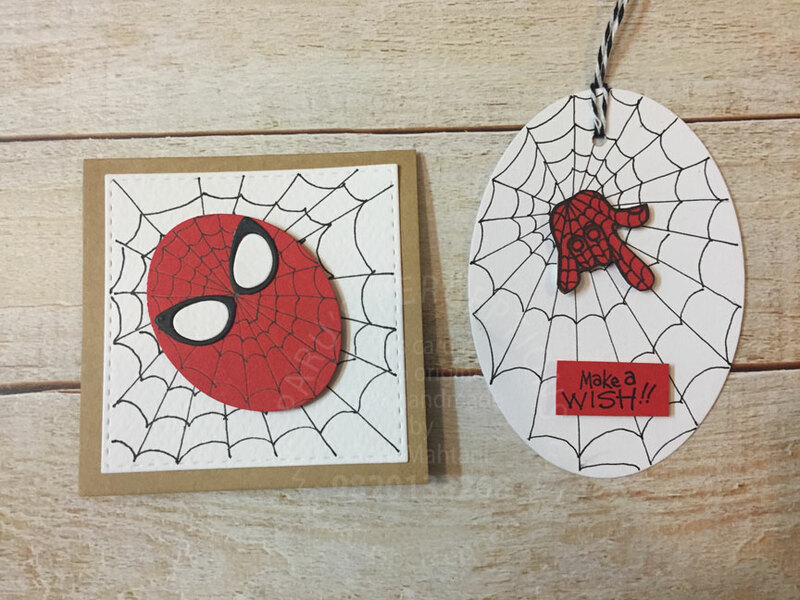 As the theme is anything goes, I decided to make a Spiderman themed notecard and tag! For the card, I started by using my oval punch to create the basic shape. 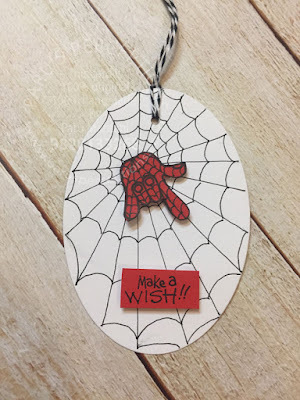 I then used a Steadler XS tip pen to create the web. For the eyes, I die cut the Impression Obsession spectacles in black and white; Cut the black spectacles in the middle and added the white centres. 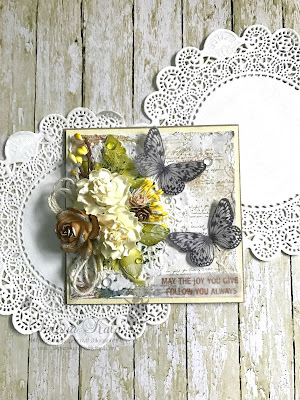 I die cut a white square using Simon Says Stamp Stitched squares, to use as the background. I drew the spider web using a black micro tip pen. I then adhered it to a kraft 3"x3" kraft card base to make a fun note card. For the tag, I started by using an Oval die cut. I drew a spiderweb using a black micro tip pen. I used the love sign hand from Paper Smooches 'Helping Hands' to create Spiderman's hand! I drew the spider web on the hand using the same micro tip pen as before, and added it to the centre of the web. I added a sentiment from Stampendous' 'Cupcake Numbers' stamp set. I'm quite thrilled the way these two turned out! I hope to have inspired to play with your supplies and create something different! Am delighted to guest design here today at ParuCardmaking Challenges. Its such an honor to be invited and Thanks much for the lovely opportunity, Paru. I Am SathyaKala, Toxicologist by Qualification and Passionate Papercraft Enthusiast. 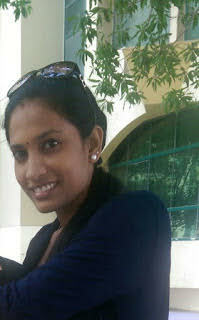 Am from Chennai, currently residing at UAE. Married to a wonderful friend and we are blessed with 8 year son. Am inclined towards art forms from childhood. Its much with Dance and Music in earlier part of my childhood with coloring, embroidery being my favorite hobby. When i stumbled upon a Food-Art blog in 2011, i discovered my passion for Quilling, which led me to where am today. I dabble with different art forms - Quilling, Cardmaking, Mixed media, Coloring and Brush Lettering. This keeps things fresh and my mind inventive. I find that one passion crosses over the next, giving a different spin to it. 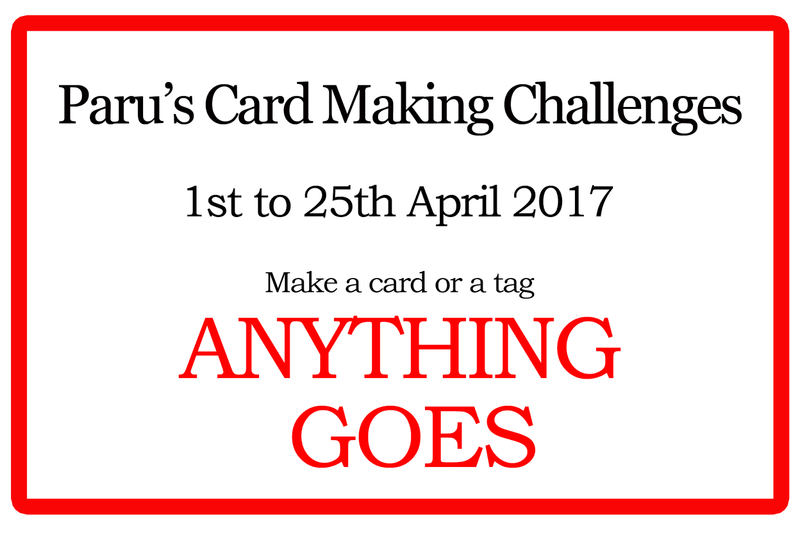 This month’s theme is "Anything Goes" at PCM and i have come up with a Mixed media card and a Tag. First up is Mixed media Card. 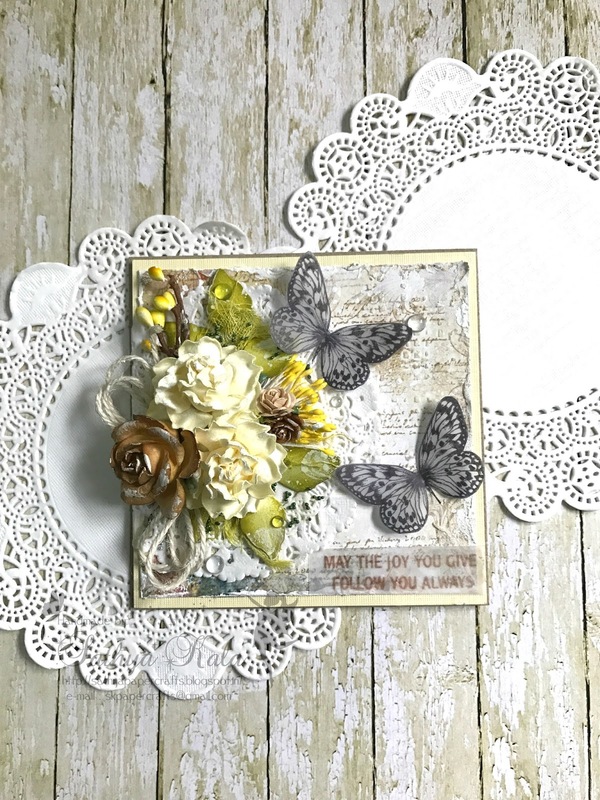 Made a mixed media square card. 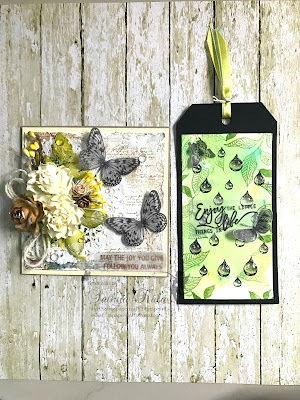 Lot of stamping , stenciling and texture pastes on the background. Floral cluster along with tinted cheesecloth, twine bow are made on a doily. 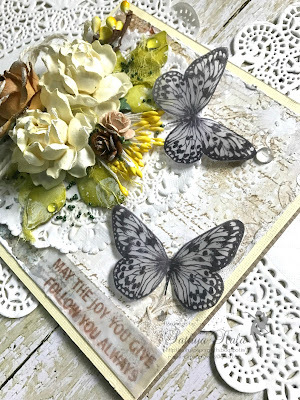 Few vellum butterflies, generous splashes of white gesso and few clear droplets are added as finishing touches. Next up is a Simple Tag. Made a simple Tag, with watercolor bg using Brusho crystals. 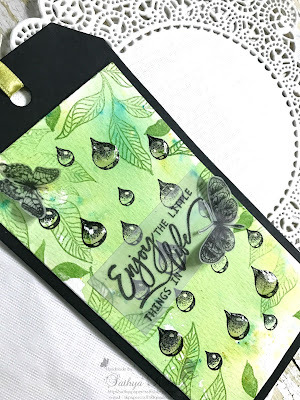 Stamped leaves stamp using Green archival ink followed by Watereffects Stamp using black archival ink. 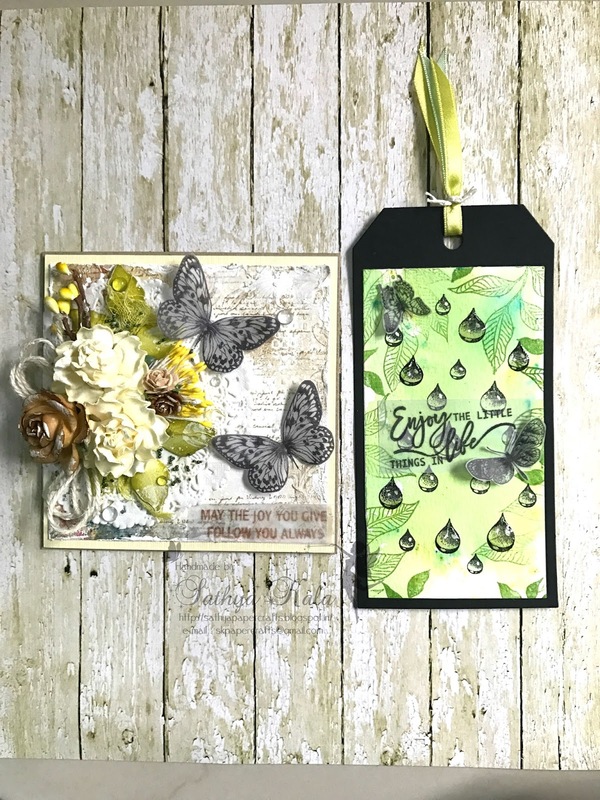 Sentiment is stamped over Vellum and added with few vellum butterflies. As a final touch, added glossy accents to few raindrops. The winner will be announced on the 28th of April, so don't forget to stop by! 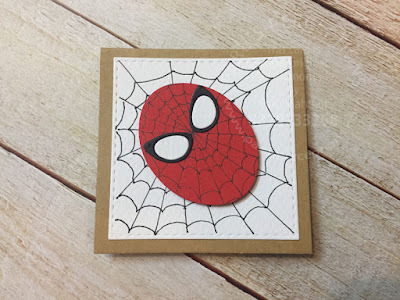 Very innovative spiderman card and tag Paru M'am...And Lovely Inspiration by Sathya..love the vellum butterfies..